I removed 31 more batteries tonight, from Jake's electronic keyboard and Timmy's 8 (count 'em: EIGHT) Shake 'n Go cars. Wendy reminded me about each of those cars having 3 AA batteries! Phew, I almost forgot! So the current battery count is 110. 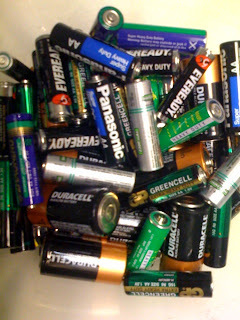 "Oh my gosh, what on earth are you doing with that enormous pile of batteries?" Um, yeah...this is one of those fine-print sorts of things they don't tell you about having young kids while in the military. You know all those cool toys my kids have? The various Christmas, birthday, "gosh, I've missed you" gifts? The "congratulations on potty training", "Preschool graduation" and "You were good today at Target" gifts? So many of those toys have batteries, and when you have a commercial mover coming in 2 weeks to pack up your stuff, you want to start early on the quest to get as many of those batteries removed as possible. The packers/movers don't remove the batteries...you do. When the packer comes across something with batteries...if they're nice they'll give you a chance to remove the batteries so it can get packed with everything else. If they aren't nice, they quietly set the item aside and continue packing around it...and before you know it, Jake's bedroom is full of sealed boxes with one Lamaze lullaby toy lying in the corner. What you're looking at in the picture is a view down into a plastic storage bin of batteries. The bin is about 1/2 full, and these are all the batteries EXCEPT for the boys' GeoTrax and Tomy "Blue Track" Thomas the Tank Engine sets. Those two train sets will probably triple what I've already removed...but the boys are still playing with those sets at least daily, so I'll wait until just a couple days before the packers come before I tackle that. The bin currently contains 79 batteries. Most of which are AAs, not enough of which are rechargables. Most of our rechargables are in the GeoTrax, thank heavens. Also, I came across at least a dozen corroded batteries, so those are discarded. And let's not forgot those other "illegal-to-pack" items: light bulbs, cash (i.e., the contents of my boys' piggy banks), and liquids. We got back from Pennsylvania around 5pm tonight. In Richmond, on I-95 right through downtown, a car in front of me rolled over a piece of tire and it whipped into the front end of the Prius. I wish I had more time to react, but I didn't. Even though Dave and I were thinking about pulling over to check out the damages, downtown Richmond is NOT the place to just pull over anywhere. While our car was driving fine afterwards, two pieces of the 3-piece plastic grill for the air intake were destroyed. There's also a slight dent on the right side of the lip under the intake area. Just enough that we'll probably have to get it repaired/replaced before we can replace the plastic grillage. Ya know, it's always so wonderful when we're in PA -- and stuff like this always happens when we get home. In 2006 it was Jake's broken leg...in 2007 Dave was wrapping up his changing of advisors/offices on campus. I guess this is relatively small by comparison...but certainly par for the course!